The main purposes of controlling the electric melting process are to achieve a maximum performance or minimum cost of a predetermined amount of steel with a certain chemical composition. The purpose of optimizing the control of electric conditions when making steel in an arc furnace is to ensure rapid melting of the charge and heating the metal to a predetermined temperature required for an intensive behavior of the physico-chemical processes at the highest possible active power consumed by the furnace. In this work the problem posed is resolved by using an automatic optimization system realizing such a mode of searching for current magnitude at which a maximum active power is ensured. On the basis of the cell-automatic method the dynamics of dissolution carbonaceous wire in an industrial scoop was investigated. The calculated models allow for hydrodynamics of ram flows in conditions of constant submission of argon in the scoop. The computational distributions of сarboneum were established in a scoop in different times of stirring. It was demonstraied, that the increase of entry speed of a wire in the scoop provides the best conditions of dissolution. The role of effective use of hydrogen and methods of controlling its negative influence on the formation of cast aluminum alloys with a predetermined level of quality and properties is discussed. The ability of hydrogen to act as a control parameter of fundamentally new processes referred to as "hydrogen casting technologies" that allow creating promising structural materials. Answers are given to how the solidification occurs, whether the solidification and melting are reversible, what the mechanism of the solidification's effect on the structure and properties of the solidified melt is. The main phenomena that show during the phase transformation are explained. The issues of the solidification theory are discussed at the level that is sufficient for resolving practical problems of metallurgy and metalcasting - producing castings with regulated structure and quality. It has been shown that the instability of the dendritic structure due to a sharp increase of the initial dimensions of dendrites shows only in the finishing stages of the dendritic growth. It is proposed to assess such an enlargement of dendrites by the ratio of distances between the secondary branches in crystals in the zones of monolithic and porous metal. Two main technological lines of investment casting: casting parts with an equiaxial structure and making castings with a columnar or monocrystal structure used in the production of turbine blades are presented. Methods of influencing the process for the purpose of improving the quality of melted products are discussed. The results of optimization calculation of the stock with the use of a priori information for the case of receiving cylinder sleeves for forced diesel engines by continuous directional solidification technique are presented. The article points out the main features of superhigh frequency electromagnetic field, discusses the behavior of the dielectric (ceramics) placed in such a field, and various mechanisms of its polarization. The necessity of using SHF energy in improving the process of making highly refractory polymer-bonded shell molds that are used in the production of cast blades for gas turbines engines from heat-resistant alloys by the method of high-gradient directional solidification has been founded. The structural state and the level of mechanical properties in heat-treated high-strength structural steel, and the peculiarities of its hydrogenation at galvanizing and applying other electrochemical coatings are discussed. It is recommended to reduce the degree of hydrogen embrittlement by varying both the coating process and the process of heat treatment. 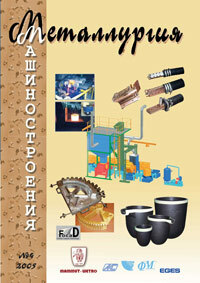 Experience of forge 8-tons ingots casting in mould without прибыльных надставок is stated in this article. Results of casting of ingots with internal crystallizers are resulted. The offered methods of reception of forge ingots are introduced into manufacture and provide improvement of quality of metal, simplification of technology. A review of the monograph by L.I. Tushinsky "The Structural Theory of Constructive Strength of Materials"